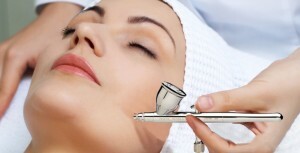 A Bella Pelle Oxygen Rejuvenation and infusion is a non invasive treatment that targets fine lines, wrinkles and dramatically enhances overall hydration. This is also known as ‘The Events Facial’ where celebrities are flooding through the doors of their local skin clinics before their big red carpet event. This is THE FACIAL for any bride!! 1) Oxygen under light pressure aids delivery of age defying actives to the deeper layers of the skin at the same time as cooling and calming the skin. 2) A unique, powerful highly concentrated serum which contains lightweight Hyaluronic Acid and a powerful combination of vitamins and antioxidants, and a blend of botanical brighteners is applied to the skin. The Hyaluronic Acid helps to instantly hydrate the skin resulting in Increased firmness, reduced fine lines and wrinkles, improved facial contours and overall radiance. Botanical brighteners help balance skin tone and Vitamin C protects and defends against environmental damage and premature skin aging. 3) Treatment Support Products provide essential layers to seal in and supplement skin nutrients for maximum synergistic effect and longer lasting results. Deeply hydrates by infusing a potent hyaluronic acid.